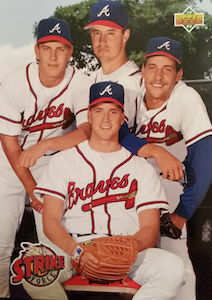 Tom Glavine was one-third of the Atlanta Braves' "Big 3" pitching rotation that dominated the National League East for the better part of a decade. Along the way, the left-handed starting pitcher compiled numbers which gained him entrance into the Baseball Hall of Fame. 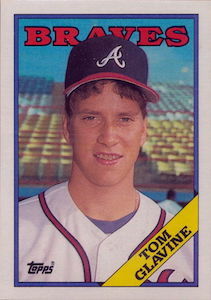 This list of the top Tom Glavine cards shows an array of options from his entire playing career. 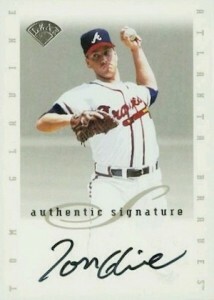 Shop for Tom Glavine Autograph Cards on eBay. It's hard to imagine that a player whose first full season in the MLB produced a 7-17 win-loss record and an ERA of 4.56 would end their career with more than 300 wins, two Cy Young Awards, and a World Series MVP award. Throughout the 1990s, Tom Glavine teamed with John Smoltz and Greg Maddux to form one of the best pitching trios in the history of baseball. Starting in 1991, the Braves would make the playoffs every single year that Glavine pitched for the team until he left for the New York Mets in 2003. He was the second-winningest pitcher during the 1990s, behind teammate Greg Maddux, and ended his career as the sixth left-handed pitcher to record more than 300 wins in their career. The first Tom Glavine MLB cards were issued in the summer of 1988, which might possibly be one of the softest years for rookie cards during the junk wax era. There are a few of his earlier cards, starting in 1986, which offer collectors more of a challenge, but it's hard to imagine that a Hall of Fame player would have rookie cards that could be bought for the change in your pocket. That describes most of the Tom Glavine rookie cards issued by the major card manufacturers. In spite of the rock-bottom prices on his early cards, Glavine has been a favorite of collectors throughout his playing career and into his retirement. Over the better part of the past two decades, Glavine has been included in some of the most highly sought-after and innovative card products available to collectors. The top ten list below showcases a wide variety of cards featuring the former pitching star. Tom Glavine played with John Smoltz and Greg Maddux for more than a decade, yet there were not a lot of cards with the three Hall of Fame pitchers shown altogether. While there have been a handful over the years, this Upper Deck team card from the 1993 set is one of the more popular options with collectors. True to Upper Deck's style, this card features a great picture of the three 1990s Atlanta Braves Hall of Fame pitchers, along with Steve Avery, and a full-bleed design. This card is inexpensive and plentiful, but still a great addition to any collection. 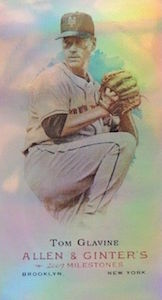 Although many of Glavine's earliest cards were typical of the junk wax era, overproduced and low in value, there are some options available to collectors outside of major card manufacturers. 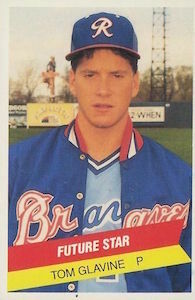 One such card is the 1987 TCMA International League All-Star card, which shows Glavine as a member of the Braves Triple-A club in Richmond. This card is not too difficult to find and is still relatively easy on the wallet. In many cases, the card can be found as part of the complete set which includes several future Major Leaguers like Jay Buhner, Todd Stottlemyre, and Al Leiter. There is also a base version for Glavine. Tom Glavine helped the Braves win the 1995 World Series by pitching a one-hit gem against the Cleveland Indians in the clinching Game 6. He ended up appearing in the World Series a total of 5 times during his 22-year career, winning four games for the Braves. This 2000 UD Hologrfx celebrated the Braves' appearance in the 1999 World Series against the New York Yankees. The Hologrfx set was an inexpensive product, but this insert featuring game-used World Series base relics for the star players of both teams has made this insert popular with collectors. 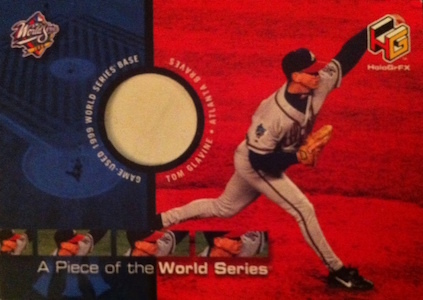 A Piece of the World Series also features cards of Chipper Jones, Greg Maddux, Derek Jeter, and Roger Clemens. Collectors with a little more money to spend can also seek out the autographed versions of the cards which are serial numbered to the player's jersey number. eTopps was a program run by Topps starting in 2000 and it lasted until the card company essentially pulled the plug in 2012. If you never participated in the eTopps program, collectors could purchase exclusive cards though the website at different prices. The cost of the cards varied based on the player featured on the card and the print run issued by Topps. Unlike the current digital cards being offered by Topps today, collectors could pay shipping and have the physical cards they purchased on eTopps mailed to them. In 2007, eTopps offered collectors a set of Allen & Ginter cards which celebrated different milestones accomplished by players during that season. 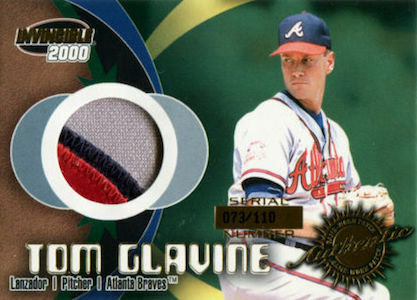 Glavine's card in the set recognized the his 300th win that came pitching for the New York Mets. The set also has milestones cards for Hall of Famers Frank Thomas and Craig Biggio. 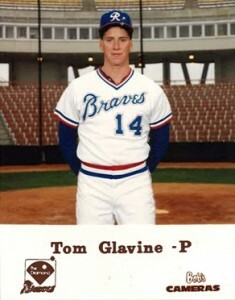 The 1988 Topps set included only one Hall of Fame rookie card, Tom Glavine. The set was completely over-produced, meaning the rookie can easily be found for very little, but this card is still worth owning. Many other card releases in 1988 also included Glavine rookie cards in their checklists, however, none of them offer as clean of design as his first Topps card. The white border and large portrait photograph of the Hall of Famer is still a very popular card with collectors. Glavine had a wide selection of memorabilia cards made throughout his career and extending into his retirement years. Collectors can find plenty of single-color jersey pieces of him in many of the early 2000 products. There are also a few premium card products which have some nice patch pieces of Glavine, but the lower print runs mean collectors often pay a premium for those cards and have a limited opportunity to own them. His inclusion in the Pacific Invincible Game Used Gear set offered collectors a chance to own a patch relic and the card has a more generous print run of 110 cards. While card companies frequently issue low print runs of patch cards, Pacific often made larger quantities of their memorabilia cards. Tom Glavine's first certified autograph came from the popular Leaf Signature set. The former great was a part of the Extended Set, which was basically the second series of Leaf Signature. 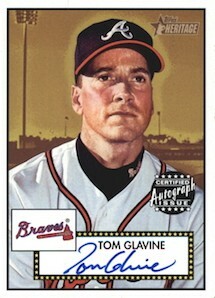 Most signers in Leaf Signature provided 5,000 autographed cards, but Glavine was short printed at just 1,250 copies. That sounds like a generous amount in today's collecting world, but copies of this card carry a premium and can be a hard find on the secondary market. 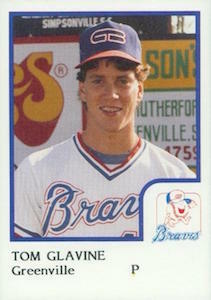 The 1987 Bob's Camera Richmond Braves Tom Glavine card is the most challenging pre-rookie card for collectors to track down. The Richmond Braves gave out Bob's Camera sets during the 1980s and 1990s, with set print runs as low as 500 copies. There are not too many of these cards floating around, as evidenced by the low population numbers on graded card sites. The Bob's Camera Richmond Braves Tom Glavine card carries a price that is more in line with Hall of Fame rookie cards from the 1950s, than the junk wax era. The Topps Heritage set is one of the great card products of the 2000s. Tom Glavine was one of the 26 current players included in the debut of the Heritage product. The blue or black autographs do not have serial numbers, but the cards have a total print run of 200 copies. There is also a red version of this card that is hand numbered to just 52 copies. While this is not Glavine's first, nor his last autograph, it's hard to find a nicer on-card autograph. The 1986 Pro Cards Greenville Braves card offers collectors another opportunity to track down a valuable minor league card of Tom Glavine. This prospect card does not have the limited quantities of the Bob's Camera card, but it is also a more affordable option. Copies of this card are easy enough to find and are popular with collectors of the Hall of Famer. 1996 Leaf Preferred Gold Press Proofs Tom Glavine #74 Braves Rare! Hey Thank’s Eric real helpful !